How do we understand the impact of climate change and natural disasters on people and architecture, and how does humanity learn from our mistakes and try to prepare for potential future cataclysms? That is ostensibly the agenda of "Sink or Swim: Designing for a Sea Change," an exhibition opening Dec. 13 at the Annenberg Space for Photography, curated by Frances Anderton, an architecture writer perhaps best-known as the host and executive producer of KCRW's DnA Design and Architecture radio program. What Anderton has done is bring together images by six photographers whose works reveal the cruel beauty of people in extremis, as well as the very human impulse to build again and prepare for the next storm. Among the photographers included in the show is Iwan Baan, a Dutch architectural photographer who won acclaim for depicting the human interaction with architecture and who was awarded the inaugural Julius Shulman Institute award in 2010. Baan has photographed several African communities in Nigeria and Benin that live on the water; for this project, the Annenberg sent him to document some of the flood defenses in the Hague as well as post-tsunami homes in Japan. Stephen Wilkes is known for his monumental time-lapse images, as well as his photographs of the devastation of Hurricane Katrina and for his photos of Staten Island after Hurricane Sandy. Jonas Bendiksen, a Magnum photographer, has devoted years to documenting the Bangladeshi delta communities. Monica Louwens, a California-based, Dutch-born photographer, makes images of wetlands restoration, which she contrasts with evidence of human negligence despite warning signs. Mark Holtzman's medium is aerial photography, including work about the nature and infrastructure of the Los Angeles River, Malibu and Oakland, and Kip Evans focuses on the wetlands of Elkhorn Slough in Monterey County. 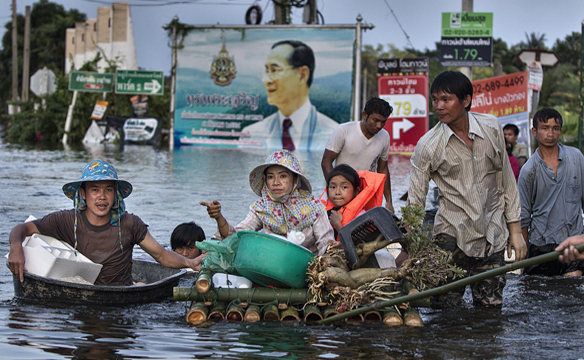 Finally, there is the work of Paula Bronstein, a photojournalist who has been based in Bangkok since 1998 and who has made a career of being present whenever there is a disaster, political turmoil or war. Currently, she is in Myanmar (formerly Burma); before that, she spent a month in Hong Kong covering the street protests. She also traveled to Japan to cover the tsunami, and to the Philippines, in 2013, when Typhoon Hiyan hit. For the Annenberg, Bronstein returned to Japan to photograph the state of recovery and preparation for the future after the 2011 earthquake and tsunami. "... These works tell such powerful stories about resiliency, climate change and architecture, as well as engage with viewers on a humanistic level," Wallis Annenberg, for whom the center is named, said in the event's press release. Among the show's photographers, each worthy in his or her own way, Bronstein stands out. For decades, she has put herself in harm's way to share with us stories to which we might not otherwise have access. She reports on events for news outlets, but she brings an artist's eye to her compositions, offering beauty and, at times, hope where none should exist. Bronstein grew up in Newton, Mass., in what she calls "a typical dysfunctional Jewish family. Very 'Seinfeld.' " After majoring in photography at the University of Colorado and photojournalism at the Rochester Institute of Technology, she eventually joined the staff of the Hartford Courant in Connecticut. In 1984, when the Bhopal gas disaster occurred at the Union Carbide plant in India, because Union Carbide was headquartered in nearby Danbury, the Courant sent Bronstein to cover what would be revealed to be one of the world's worst industrial disasters (more than 500,000 people were exposed to toxic gas). She went on to work briefly at the Chicago Tribune and Oregon's Register-Guard newspaper, then moved to Bangkok, realizing that in that region, "assignments were plentiful." She proved correct. After 9/11, she traveled to Afghanistan and embedded with troops to cover the war, and she has consistently focused as well on the plight of Afghan women and children (Bronstein is currently assembling a book of her photographs from Afghanistan). Since then, she has traveled to cover major news stories throughout the region, including in Nepal, Pakistan, Gaza, South Sudan and Vietnam, in addition to those named above. "When a big story happens in the region, I'll jump in," she said. Bronstein admits she has felt in danger "many times," but said she does not plunge into assignments in a foolhardy way. For example, Bronstein said she would not go to cover the civil war in Syria (except maybe the most Northern part). She said that throughout all her travels over the years, no one has ever raised an issue about her last name or her religion (it just doesn't come up), nor has her gender been an obstacle -- even in countries where women's rights are little respected. "It's only been a problem," Bronstein said, "that I'm American." She said there is a gang mentality -- shared by the Taliban and ISIS, as well as their sympathizers, that "if they hate Clinton, or they hate Obama, they hate you." Or, put simply: "[They] hate all Westerners." However, that doesn't stop Bronstein: "I'm always feeling that our work keeps on changing, and we have to be aware of those changes and be aware of where we are going, and assess the threat level, if there is some." For the Annenberg exhibition, Bronstein photographed the new sea walls being built off the coast of Japan that was so badly damaged by the tsunami. In a Bronstein image being used to promote the show, a small girl is shown, arms open wide for balance, walking along a gleaming sea wall that looks like an airplane wing tilted toward the sky. 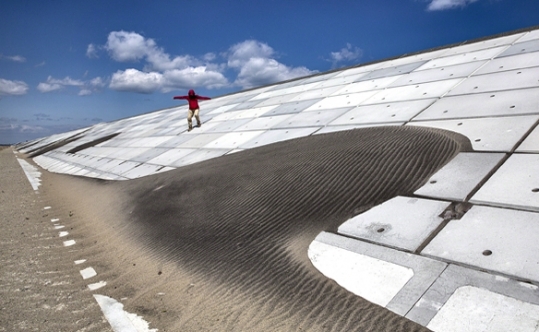 Just beyond, a large wavelike expanse of sand appears as if it, too, is trying to climb over the structure -- a vivid depiction of nature versus the elements, man versus nature, and a child who must navigate this contested future. As much metaphor as journalism, the image tells a story that is both immediate and timeless -- the very essence of Bronstein's life work. "I've always been a news photographer, so, for me, covering big news stories is important -- to document it in a way that brings attention to the subject, that brings the story to the world." "Sink or Swim: Designing for a Sea Change" is at the Annenberg Space for Photography from Dec. 13 through May 3. For more information, visit annenbergspaceforphotography.org.